Sealaska Heritage has announced the winners of its two popular traditional food contests, held as part of Celebration 2016. The winner of the black seaweed contest is Dora Barr, and the winner of the soapberry contest is Doris McLean. Second and third place in the seaweed contest went to Roberta Revey and Ivan Williams; and second and third in soapberries went to Fran Neumann and Charlene Baker. Winners of both contests were announced onstage during Friday night’s dance performances at Centennial Hall. The institute sponsors the contests to introduce young people to traditional Native foods and to highlight the health benefits of traditional Native cuisine. 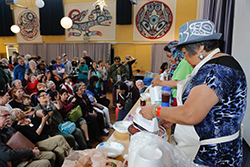 The seaweed contest was held Thursday in the Hickel Room of Centennial Hall, a designated space for elders who attend the festival. Elders and other attendees passed bowls of seaweed for sampling after the judges had reviewed the entries. Ashley Colon, one of the three judges, said she went with personal preference when picking a winner. Names of contestants were kept secret from the judges prior to the judging. For the soapberry contest, held Friday at the Juneau Arts & Culture Center, participants prepared their entries on stage, whipping the tiny, bitter berries into a frothy pink dessert with electric beaters. This year’s contest was dedicated to the memory of Helen Watkins, a longtime soapberry contest contestant who “walked into the forest” earlier this year. In comments prior to the beginning of the contest, SHI president Rosita Worl noted that Watkins was widely known for her teachings about Native foods, and encouraged the crowd to call forth Watkins’ spirit by repeating her name in unison. “She is still with us in many ways today,” Worl said. Watkins’ daughter, Leonilei Abbott sampled the soapberry entries on stage, and later said the taste brings her back to childhood, to her home in Juneau and to her family’s fish camp in Klukwan. Three top winners of both contests were awarded prizes of $500, $250 and $100. Celebration is a major, four-day event organized by Sealaska Heritage every two years. First held in 1982, it has become the one of the largest events in the state, drawing thousands of people and millions of dollars to the capital. Photo credits: Soapberry contest photos by Brian Wallace; Seaweed judging photo by Nobu Koch, courtesy of Sealaska Heritage Institute.